Thank you IB. You are so productive that you would write a book in no time at all! Good news, Malcolm, yet, you will be missed. Smiles. Bonnie, thank you. I’m sure I’ll be back but possibly in a new reincarnation. Keep up your wonderful poetry. Thank you, Malcolm. I’m convinced you’re ready for the challenge. Smile. Jon, of course. You were the first person person to suggest this to me online. Let’s stay in touch. What an adventure, writing a book! Go for it. It’s not often that desire and opportunity find themselves alone together. You will be missed around here though. Please do check in from time to time, and let us know how things are going. Best of luck, Malcolm. Love and hugs. Jhana, we haven’t known each other long but we did have somewhat of a meeting of minds. I do hope to stay in touch periodically so it’s à bientôt and not au revoir. Thank you L.P. I enjoyed our virtual office simulation together and hope to keep in touch. Let me just say that I hear blogging is a great way to promote your book when (note I said when and not if) it is published so don’t give it up! I have enjoyed connecting with you and will find it difficult to bear if you disappear completely. Given the amount of serious drama in your work life I cannot imagine the loss of a blogger making too much of a dent in your imperturbability. However, I do appreciate your heartfelt sentiments and am confident that I will not disappear completely 🙂 I also agree with your comment about blogging to promote a book, which is why I know I will return, albeit in a different guise. Bloggers that I find interesting and entertaining are dropping off all of the time and it does leave a hole. Best of luck! Well, good for you. Let us know how it’s going, when you can. Thank you Matt. Will do. I appreciate all your support over the years. Ha ha. Three cheers to your wife! And best wishes, Malcolm. What are you writing? Fiction? Essays? The blog has been, and I am sure will manifest itself in the book, a joy and inspiration. I’ve read posts from topical to personal, libertarian to outrageous, and all the way back to specifically about your friends and family. Sometimes too close to home, but always heartfelt. Some days the truth hurts doesn’t it? Well done on making a timing call. Go for it I say! At a certain point that is the only most precious resource we have left, our own time. What we do with it, who we spend it with, or without in some cases, is our best gift to others. I trust a long hike, an arduous climb or a lazy night in a tent listening to the bears rustle your food will help spark more topics. If not, I might be solo this year. I’m not deserting you. Count me in for some more crazy climbs or bears on the trail. Go for it. I will miss your articles, but I will read your book. Thank you my friend. I’m not a great correspondent but we’ll keep in touch. Best wishes. I hope it the writing goes well. I think it will! I appreciate the vote of confidence. I must say I’m looking forward to getting my teeth into it. Dang, a whole book in which to indulge your extraordinary skills! I would wish you luck, but I doubt you’ll need it. I’ll miss your blog, but look forward to reading your book. That’s praise indeed coming from you Mikels and I’ll make sure to give the prospective publisher your name so they can ask you about those “extraordinary skills” of mine 🙂 Maybe you would be willing to comment on some of the drafts at some point? I would appreciate your critique. I would be delighted, as long as they’re fed to me slowly. Mikels, they will be slow and a long time in coming. Many Thanks. Excellent! I’m sure it will be a brilliant read, but I will definitely miss your posts. Thanks Brett and I expect great things from you in academia. That’s great! It’s so fun writing books. Good Luck! Blood is life–you bleed that on to the page, it’s true, but (and this is literally true) I never felt so alive as when I once almost bled to death. Writing novels allows for a slightly safer version of getting close to the essence or source of that life blood. (I think Hemingway was being a bit of a drama queen–though I adore his Nick Adams stories). So have fun or bleed! Will do Nico. Keep up the icy suicidal cycling in a blizzard that you revel in so much. You go, Malcolm! 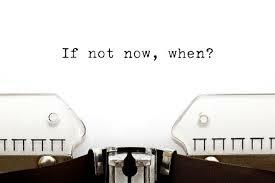 As an author and book coach/instructor, I always say, there is no better time than NOW! As a matter of fact, probably the most important thing I teach my writing students is how to PRIORITIZE their time. Looks like you’ve done a good job with that, and I will be looking forward to reading your book; though I will miss reading your blogs and your blogging support. I can guarantee I’ll be making plenty of use of the Serenity Prayer during the book writing process! Thank you for your support. I love your blogs and am sorry that I found you just in time to bid you farewell. I do look forward to reading your book, and send wishes for great success in your new journey. Thank you for your kind sentiments and good wishes. I am sorry to be leaving. What a nice thing it is to have a fine book to look forward to! Ah, there speaks a man with experience. I’m sorry our acquaintance was so brief as I’m certain we would have had some interesting discussions. Maybe another time? Please don’t hesitate to lean on me for suggestions from my own experience. A nice and grand announcement. =) How happy I was, MG. This is big. You’ll be bleeding. (I actually disagreed with Hemingway in one sense, in an old post, but not important at the moment.) I am glad to see you mention a publisher. I think that is the best route for you (what I would do), as opposed to self-publishing. You might find these useful. Chris’ blog is more about striking out on your own but the diagram is helpful. Clearly your fans will miss you. Certainly don’t let our blogs distract you from such an important enterprise. Enjoy the journey. Goodbye HW. Thank you for the links. They will be useful just as all your suggestions have been. You’re so talented I’m sure you will write your own bestseller as soon as you have home schooled little Einstein. Thank you Audra, I will also miss the haiku queen but will make sure to let you know about the book. This kind of public commitment makes me fee more accountable and determined not to give up. Well said … and best of luck of the book adventure. Stay the course and be well. Thank you. I’m sorry it was such a brief acquaintance. I think I had just got used to your particular brand of humor which is very different from mine. I am determined to stay the course, so hopefully I will be back. Good luck on this new endeavor! I’ve enjoyed reading your posts and look forward to reading your book in the future. Over the past two years, I’ve learned a lot about writing and publishing, if you have any questions, feel free to comment on SmoothingIt. Comments don’t post unless I approve them, so you’re welcome to include an email address. Best of luck to you, my friend. I’m actually stepping back into SmoothingIt this week and was looking forward to seeing you in the blogosphere again. Duncan, I may very well take you up on your offer. I missed your comments and am sorry that I’m leaving just as you are returning to the blogosphere. However, I am sure I will be back. Sounds good, Malcolm. I’ll be looking forward to it. Intriguing, but I enjoy anticipation, so I’ll happily wait to be surprised! This is fantastic Malcolm, look forward to your creation ~ you’ve got a talent with words that does not come around too often. Cheers. Dalo, thank you for all your encouragement and support. Let me know if you are ever visiting this part of the world as I would love to meet up with you for coffee sometime. Good for you Malcolm. My blogging life is certainly cutting into my publishing time. It’s very hard to juggle so many things. I envy you that you can just cut yourself off. Perhaps I’ll have to toughen up. 🙂 Good luck. Thank you. Cutting oneself off is like parachute jumping, you just do it and then look back and wonder how on earth you did it. I just have to prioritize otherwise the book will never get written. I wish you all the best and fun with writing the book. It’s going to be a 16th century popular history, but that’s all I can say about it at present. Love it, Malcolm!! Really looking forward to see what comes out of it! Thanks Mike. It’s a very rewarding project as I love history and I’m writing about two wonderful characters in 16th century Europe. I will certainly try and keep everyone updated. I hope the book is going wonderfully well, Malcolm. It’s great you decided, it’s now or never, and dived in! I wish you the best of luck, and look forward to reading when it’s done. Take care. Thank you Michele and I hope you continue to find time to write your own poetry as editing Verity La must be quite a commitment. Still doing more reading than writing (it’s going to be a popular history book) but will certainly let you know when it’s out. I was wondering where you went. I wish you all the best. Thank you sir, I’ve enjoyed our interactions which have always remained civil despite some profound differences of opinion. Believe me there is plenty of “bleeding” going on this end, but I want to thank you for always having been so supportive. Let’s hope that each of us finds our muse and can eventually exorcise the ghosts and return to the warmth of our blogging relationship. Bex, thank you. I don’t think I can remember blogging without you being there and I always appreciated your “savvy” comments. I know that over the last few years you have experienced much drama in your life so I hope everything is now looking up for you. It’s “Hasta luego”, definitely not “Adios”. Malcolm, you’ve taken on your very own Ironman. Your endeavor will be just as grueling as any endurance/distance race. Your mental toughness is going to be tested. I have no doubt you will prevail but there will be days where you will not want to continue, I am here to tell you to NOT listen to the voices. It will be through consistency, most especially on the days you will not feel like writing, that you will prevail. Consistency and your will. Tahira, the Ironman is a great analogy and I realize you know this from experience. I will definitely try and remember this advice whenever the black dog makes an appearance. Meanwhile, make the most of the summer and enjoy your wilderness journeys Tahira. You and I both share that particular passion. Congratulations on your decision to write a book. I’m glad this experience is a gift you decided to give yourself. You’re right. It’s now or never. I hope the book is going well, Malcolm. But I’d be interested to read anything you’d care to put forward about the Greek economy and the wider Eurozone. Looks to me like a slow painful death is about to begin and drag over two or three decades but I’d welcome the opinion of a professional. Well Done and All the Best -:)! Thank you Daniela. It is difficult to keep away from the blogosphere. I hope you’re still reading comments and I want to wish you the best of inspiration in your book writing. I agree it’s a good idea as you have so many interesting things to say. My own advice, though, would be not to abandon your blogging completely as your blog is always going to be an important marketing platform for the finished book. Having a blog with a well. established fan base is one of the things that helps make literary agents sit up and take more notice. Ah yes, I know how that feels! Well, I love your blog and I am sure I’m one of many who will wait patiently for you to have more time again! Good luck on the book! I started blogging to get back to finishing a book but I haven’t finished it yet. Perhaps I should give up blogging! Thank you for the support. Please don’t give up the blogging. I’m learning that when you have something important to be done you need to give it to a busy person. I missed this news because I’ve been absent from blogging too, but not to write a book! Good for you; stay the course. Belated thanks for your comment. Just stumbled by and saw this post. Best of luck with your endeavor. Hope your writing is going well and your bleeding minimal. Belated thanks Tony. The blood is running in the streets. Best wishes to your endeavors! !